Do you know someone who has to travel alot? 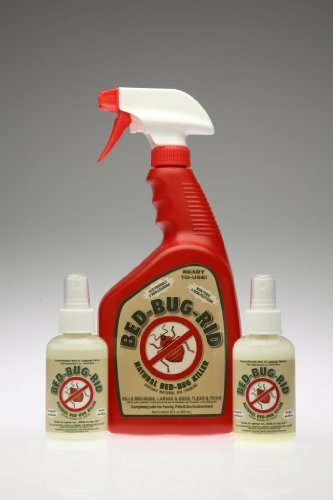 BED-BUG-RID kills bed-bugs, larvae, eggs, fleas, lice, ticks and most indoor and outdoor bugs. BED-BUG-RID is an effective, 100% natural, non-toxic, environmentally-friendly treatment that exterminates bed-bugs without the use of pesticides. This natural product formula, with residual effect (diatomaceous earth- lethal to insects) controls bed-bug infestations without the use of dangerous chemicals. Bed-Bug-Rid works as an indoor and outdoor insect killer on varied species, including cockroaches. Bed-Bug-Rid dries and leaves a fine coating of diatomaceous earth, that continues to kill eggs and larvae. The EPA suggests; ""prevention and non-chemical treatment of infestations is the best way to avoid or eliminate a bed-bug problem. Have You Considered Gifting Flowers?